Back in March 2008 , I had written a list of Ten places to eat in Toronto – not necessarily "the best" places to eat in Toronto, (how can you ever pick? ), but definitely some of my favourites, for a variety of different reasons. 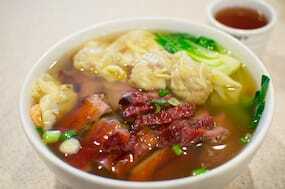 Among that list was King’s Noodle Restaurant on the corner of Spadina & Dundas in Chinatown. Since moving back to Toronto this year, Michelle and I have had a couple opportunities to dine at King’s Noodle. King’s is definitely a very busy place and they’re exceptionally efficient at turning over tables very quickly. To give you an idea of how busy it gets, we’ve been asked on a couple occasions if we mind sharing a table (and we never mind) – it’s common to see two or three couples sharing one of their big round tables that normally accommodate eight people in the center of the dining room. 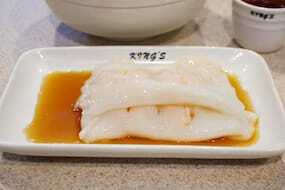 Yes, it’s a super busy place, but I like that, because it forces the food to be fresh all the time. don’t get me wrong – the service at King’s isn’t unpleasant. it’s just a busy place and their focus is on speed and efficiency, not on creating a memorable dining experience. If you’re looking for a quick place to eat and want to be in and out really quick, this place is perfect. A benefit to this extremely high turnover, as I mentioned before, is that the food is always fresh. They go through so much food, there’s just no other way to do it. I also like the fact that the majority of their food is cooked in the open kitchen at the front so you can always keep an eye on things. it’s fresh, it’s clean, and most importantly, it’s delicious! Apart from noodles, BBQ meats are another specialty of King’s. In fact, most dishes are a combination of noodles and some sort of BBQ meat, be it BBQ chicken, BBQ duck, BBQ pork, BBQ octopus, etc. The BBQ duck at King’s is something I crave very often – I could have it all the time! In fact, whenever Michelle and I go to King’s and we don’t order BBQ duck, we regret it. Not that their other dishes aren’t good, no, not at all, it’s just that the BBQ duck is just too good to miss! To say that King’s prices are reasonable would be an understatement. On more than one occasion, Michelle and I both have walked away stuffed on just $10 (including tax and tip). Their prices are super affordable and we often wonder how they can afford to serve this high-quality, uncompromising, delicious food at such low prices. If you’ve never been to King’s, I highly recommend you go and check it out. Let me know what you think! 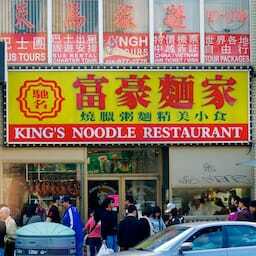 King’s Noodle Restaurant was published on Friday, October 22, 2010 at 4:00pm EDT by Daniel Menjívar and last updated on April 11, 2018 at 9:30pm UTC .